It is a widely observed Jewish tradition to commemorate the passing of a relative or loved one on the walls within a temple. All temples and many organizations devote an area within or near the sanctuary to memorializing those that have departed on a dedicated memorial wall. 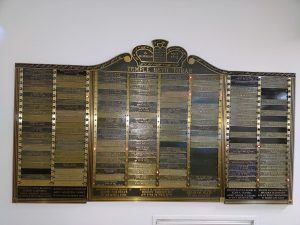 Nameplates or plaques are inscribed with the English and Hebrew names of the departed along with the date of death in both the standard and Hebrew calendar. Beside each plaque is a memorial light, which is lit annually on the Yahrzeit and Yizkor services. In TBT our Memorial Plaques are located on our Sanctuary Walls. The Ritual Committee keeps the lights lit in observance of yarhzeits and holidays. Each plaque is inscribed with the Hebrew and English name and date of death. I agree to pay a total of $380.00 per plaque, as a donation to Temple Beth Torah. I understand that each year, on the Yahrzeit of the departed, and on other appropriate occasions, in accordance with Jewish custom, the light on the plaque will be lit. I also understand that a reminder will be sent to me in advance of the Yahrzeit. Instructions for Hebrew Name. Men’s names should include “ben” and the deceased’s father’s name. Women’s names should include “bat” and the deceased’s father’s name. The deceased’s mother’s name may also be included. The Hebrew date may have been provided for you by the Funeral Director. If not, we will look it up for you.